Pair of Italian Fontana Arte style brass and glass pendant light, Italy, 1970s. Celling light in glass of Murano, Italy 1970s. Round mirror by Fontana Arte, Italy, 1970s. 15 bulbs each. Set of two assorted wall lamps available. Tree-color celling light in glass by Stilnovo, Italy 1970s. Exceptional pair of light pendants in the style of Fontana Arte. Beautifully crafted high quality glass. One pair available. E 27 light bulb fittings. Fontana Arte chiseled glass pendant light made during the late 1960s. Wheel shaped, 13 lights brass and smoked square bevelled glass, Mid-Century Modern, Italian chandelier, design by Gino Paroldo, probably edited by Fontana Arte, circa 1970s. Rewired. Pendant lamp with hand-sculpted glass Verde Nilo in the style of Fontana Arte, Italy, 1970. 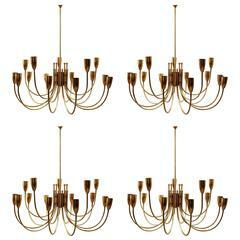 4-light pendant chandelier in brass and glass attributed to Pietro Chiesa for Fontana Arte, Italy, 1940s. This light is extremely elegant.